Amarillo, Texas, is the perfect destination for foodies, history buffs, and outdoor enthusiasts alike. Visitors can experience historic Route 66, majestic state parks, the performing arts, and some of America’s best restaurant destinations. For the traveling gourmet food lovers headed to this Texan panhandle city, here are 5 unforgettable restaurants to check out. Rated No. 1 in the Lone Star State, The Big Texan is the premier destination for flame-grilled steaks and craft beers in Amarillo. Tourists love the Texan-themed gift shop and the Starlight Ranch Event Center, which offers concerts, zip lining, miniature golf, and the Route 66 maze. With so much to do in the area, it makes sense to stay overnight at one of the highest-rated Amarillo hotels. For guests who want to earn a free meal, The Big Texan offers the 72-ounce steak challenge. 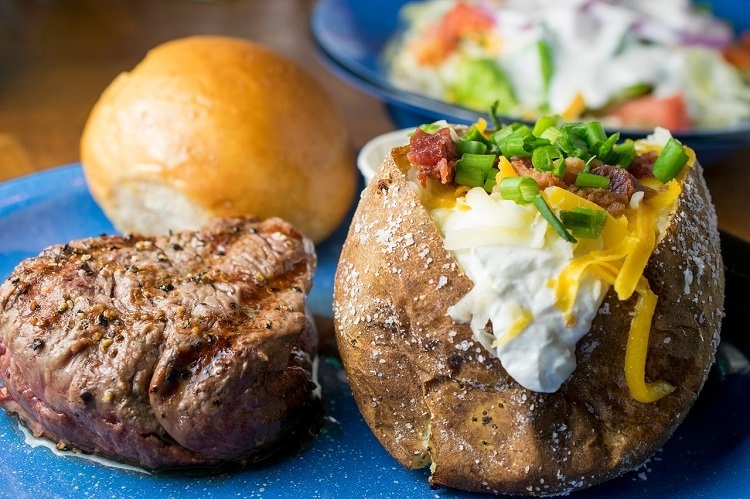 If you eat the 72-ounce steak, shrimp cocktail, baked potato, salad, and roll within an hour, you’ll get the $72 meal for free. If you judge a restaurant on its ability to create a delicious burger, you are sure to love Coyote Bluff Cafe. All burgers are made with a half pound of quality ground beef and cooked to perfection. For those guests who prefer to avoid red-meat, Coyote Bluff offers grilled chicken sandwiches served on your choice of a white, whole wheat, or onion bun. It offers a variety of hot and spicy toppings for every steak or sandwich too, including jalapenos, green chilies, Tabasco, and more. Experience the best burger in Amarillo at Coyote Bluff Cafe. Have a hankering for a good, home-cooked meal? Look no further than the Calico County Restaurant. Enjoy complimentary, homemade dinner or cinnamon rolls while your meal is prepared. Choose from delectable dishes, like Mother’s Juicy Pot Roast, chicken-fried steak, an open-faced roast beef sandwich, salads, burgers, and freshly prepared veggies. The taste of home is waiting for you at Calico County Restaurant. Named one of Texas’s top 50 BBQ joints, Tyler’s Barbeque offers delicious brisket, chicken, pulled pork, and ribs — cooked “low and slow” to provide guests with the restaurant’s signature, winning taste. Whether you are looking for a family-sized meal equipped with your choice of mouthwatering sides or you choose dine alone, Tyler’s offers a variety of portion sizes for every occasion. When only the best barbeque will do, check out Tyler’s. Are you looking for appetizing Mexican food? El Trejavan has been Amarillo’s hot spot for tacos, tortillas, and more for 20 years. Serving breakfast, lunch, and dinner, El Trejavan offers guests a large menu of items made with only the finest ingredients. Amarillo visitors love the fun atmosphere, big breakfasts, scrumptious desserts, and authentic, mouthwatering meals. Texas is the land of cowboys, quarter horses, and some of the most delicious food in the United States. This windy city provides visitors with the perfect balance of history, cultural events, food, and entertainment. Whether you’re visiting for business or pleasure, take time to enjoy some of these excellent dining options in Amarillo.